DETROIT (AP) - A man who police say was shot by rapper Proof, just before Proof himself was killed, died of his wounds early Tuesday, a hospital spokeswoman said. Keith Bender had been in critical condition since being shot in the head a week ago at the CCC, a nightclub on Eight Mile Road, the boundary between Detroit and the northern suburbs. Bender, 35, died early Tuesday, said Wende Berry, a spokeswoman for St. John Hospital and Medical Center. Police have said witnesses told them that Proof, a hip-hop artist and friend of Eminem, shot Bender during a dispute at the after-hours club. Bender's cousin, Mario Etheridge, then shot and killed Proof, whose real name was Deshaun Holton, they said. Etheridge, 28, has pleaded not guilty to charges of carrying a concealed weapon and discharge of a firearm in a building. His attorney, Randall Upshaw, said the shooting was in self-defense. 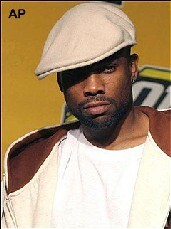 Proof, 32, was a member of the rap group D12 and was the best man in Eminem's January wedding. His funeral is scheduled for Wednesday. unfortunately about this, i'm in detroit, so i'm putting in my twenty cents about it. #1: CCC is an after hours joint. now i can't expect that any RESPONSIBLE rap star (i know that's an oxymoron, LOL) to be in one when they aren't suppose to, but come on... bad things happened to people who are in bad places, duh. #3 did he really expect that no one else was going to shoot him? in Detroit, you ain't famous. you treated with as much respect as you give. don't give none, won't be none given. duh, you're in an after hours club where negros go because they frisk in the real clubs. Proof and the shooter probably wasn't the only ones packing.